The Jaipur Literature Festival has interested me since its inception in the year 2006. It is another matter that it took me all these years to pay it a visit. But finally in 2012, I did get to visit it, courtesy my adamant college-best-friend, who, hence forth would be mentioned as BFF in this post. When BFF proposed the idea, there were still 15 days to go for the festival and since it wasn’t looming right over my head, I promised to her that we would attend the festival that year. But right after two weeks, there I was, staring at the cross-road I avoided two weeks ago, with my smooth promise. As per her plan, we could visit Jaipur over the weekend, skipping the first and the last two days, which happened to be a Friday and Monday-Tuesday, respectively.That way, we (read she) would not need to apply for leaves from office as she had Saturday and Sunday off from work. I am an entrepreneur with a start-up, so the question of leaves just did not arise. Back then, I was working 8 days a week and 2 days seemed a bit too expensive to me. Thankfully better sense prevailed just in time and we made our bookings 20 hours (that is still a lot of time by the fashion industry standards, where things aren’t really planned and they happen just as-you-go) before our departure. We booked to go by bus to Jaipur and stay there for two days and be back by train on Sunday night. So the JLF’s day 1 was not our day 1. 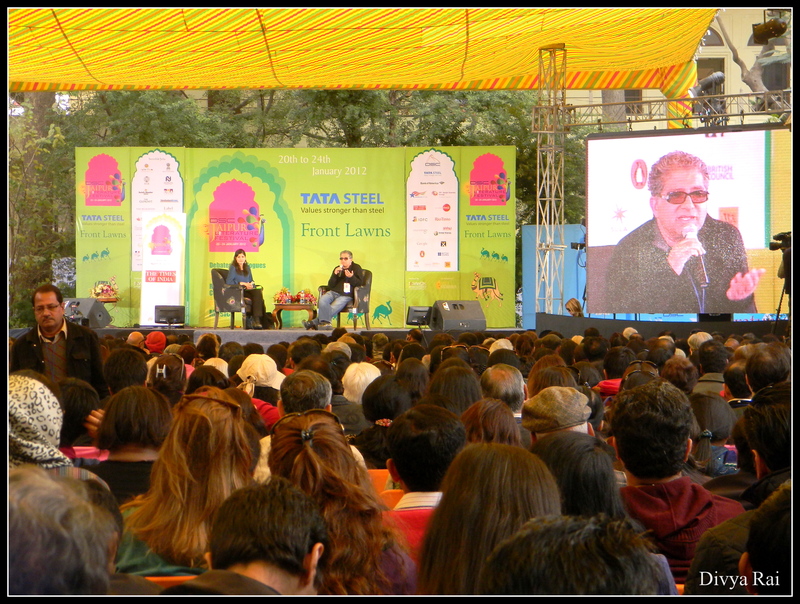 It was JLF’s day 2. We started early next morning, boarded our bus scheduled for 6:00 AM departure from Bikaner House in Delhi. It was a bitterly cold and foggy morning. The 20 minutes auto ride from my house to the Bikaner House successfully converted me into a mortal snow-woman. I had thought that BFF and I would catch up with each other on the way, but since we were planning and packing till late the night before, we were too exhausted and wanted to sleep through the journey. The bus was moving at an extremely slow and boring pace. BFF decided to stay entertained with the conversation (bickering) that was taking place between a couple who were seated right behind us. 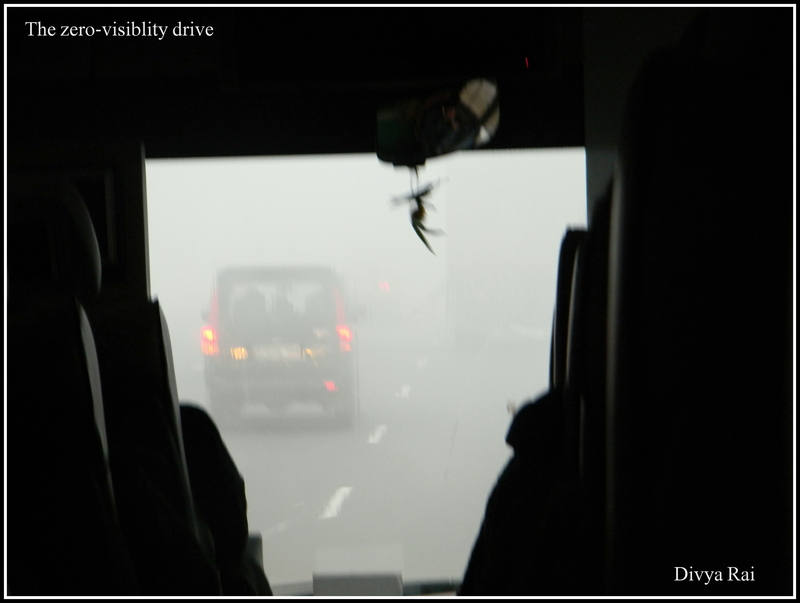 For me it was difficult to focus anywhere else except the road ahead, as the fog had densed further and the visibility had dropped to almost zero. The driver was having to brake the speed with sudden jerks, as vehicles and people would suddenly materialize out of nowhere, right in the front of moving bus. The sudden brakes were another reason why I found it too difficult to catch up on my sleep. So we checked in, got ready and got moving to the venue. When we reached the venue, we saw that one needed to register with the welcome-desk before queuing up for security-checking/metal-detector machine. The line for registration was some 200 people long snailing its way to a small tent, meant for registration and checking. I mentally calculated the time it would take us to go past security check and concluded that it would take another hour and half before we could enter. I also concluded that most probably, by then, I would be dead because of all the hunger and fatigue. I went and queued up while BFF walked right past me. I thought she is going to figure something out from the welcome-desk. But then, when she couldn’t spot me, came right back and told me that we needn’t queue up as she had registered both of us online the day before only. [Traveller’s tip: Please register online beforehand. You will thank us.] That’s the reason I so love her. She is totally on the other end of the spectrum when it comes to planning, especially travel. She, in her careful, well-planned and informed ways is a total anti-dote to my carefree and live-as-it-comes ways of life. We walked right past the snailing line and went through the security check. All it took was 7 minutes. Post the check, we were welcomed with a hand-out of event-schedule. We entered the very colourful venue of the esteemed JLF, flooded with sea of people everywhere. Upon entering, the first thing we did was, well, eat. JLF puts up some through-out-the-day snack counters with amazing ‘desi‘ fare like kachori, samosa, etc. After hogging the snacks and downing several cups of tea, we decided to focus on our second-best hobby: reading/books. Since the event-schedule only mentioned the various halls and tents with the respective speakers and their slots, it was slightly confusing for us initially. We decided to just take a walk within the venue premises and consult the schedule hand-out later. The next tent had some author we could not even sneak a peek at, and decided to check out the last ‘baithak‘ which had a Hindi literature discussion going on. Outside the baithak, we saw Bollywood producer Vidhu Vinod Chopra hob-nobbing with the media. Turned out that his 9 years old daughter had written a book of stories and poems. After gathering this information, even I wanted to write a book and release it the day after. Or leave the planet that very minute. After this recce, we understood that the various halls/tents/baithaks had talks/book-launches/panel-discussions going on and each session lasted for about 45 minutes to one hour. We zeroed in at one of the discussions in one of the tents and decided to attend it. It was the last one for the day. We waited for the session that was last-but-one in schedule to get over, and since we had some time at hand, we decided to check out the books and souvenirs shop set up by Penguin India. She did look familiar, but we somehow couldn’t place her. And she, for sure, did not look like to be from the book world. Photographers, media-men and some eager people listened to her address a small crowd. After a bit of over-hearing from the crowd, we gathered it was the Bollywood actress Yana Gupta. Who had “successfully penned” her first book regarding health and fitness. It totally dulled my spirits as I am not much into celeb-spotting and nor do I care. 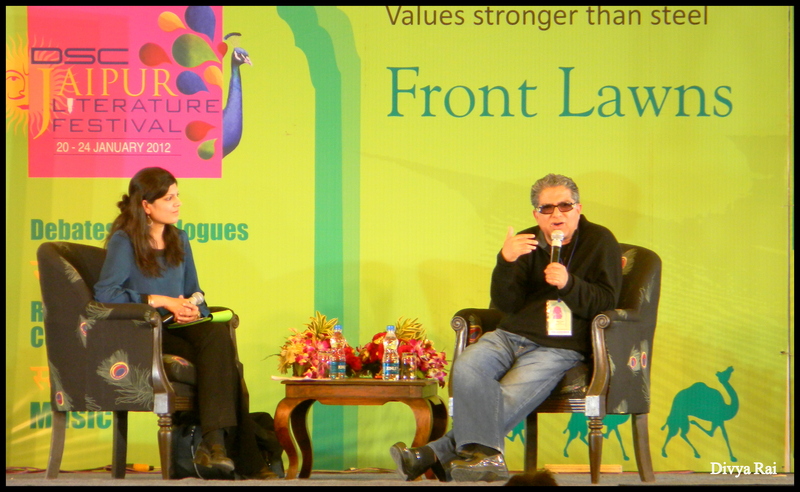 It also made me wonder about the JLF’s selection panel’s credibility AND sanity. We then understood that to be able to be seated (or to even listen to the entire thing standing), you needed to enter the tent just after the talk preceding the one you wished to attend ended. [Consider this a Traveller’s-tip, please]. This was the day 1 learning for us at the event and with this gem of a nugget, we decided to call it a day. We took out the schedule handout and strategised the next day. The next day had an interesting line-up like Shashi Tharoor, Suhel Seth :p , Oprah Winfrey, Gulzar sa’ab etc. I totally wanted to skip Oprah and the chaos that would come along with her. Whoever she is, I do not follow her, period. But BFF was sold on Oprah, so there was no way we could skip her. Oprah’s talk was scheduled to take place at 10:00 am. That meant we had to be seated (now that was the biggest joke after we saw what Oprah’s visit turned out to be) by 9:30 and queue up for security check by 8:00 am. As we were back-calculating the time deadlines, I increasingly felt like skipping the “big O” (pun unintended :p) event. So it was finally decided that we would need to get up at 6:00am if we anyhow wanted to set our foot in the Oprah’s tent. 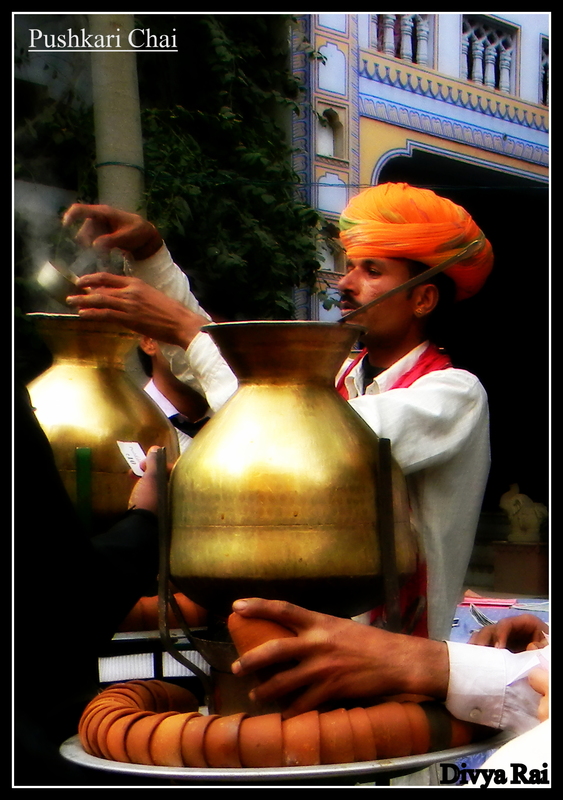 With that, we had one more cup of Pushkari chai and left the JLF venue to hang around the town before having dinner. Post dinner, we bid goodbye to my sister and headed towards our hotel. By the time we reached our room, it already was 11:30 pm. The room, because the AC wasn’t working and the vents too seemed to be closed, felt very stuffy. We called the room-service and explained this to them. We wondered how come other guests weren’t complaining, considering the fact that it was a 3-star property and the hotel was fully booked. The hotel staff did open the vents, albeit issued us a warning that it can get very cold at night. With both of us, cold is not a problem, stuffy is. Finally, at 00:30 am we flopped on to the bed, finally, setting an alarm for 6:00 am for the next day. We wanted our 5.5 hours of sleep that lied ahead of us, to make up for more than 36 hours of whirlwind of activities we had undertaken.